A screening of short films co-curated by Caitlin Franzmann and John Edmond as part of Franzmann’s Artist Residency at Karawatha Forest. This free screening, Half-Moon, explores our relationship with nature: in wonder, memory, contemplation, or our lasting impact on the world. Children friendly. Introduced by artist Caitlin Franzmann. Films will commence at 2:15pm. Please join our fb event page for any updates. 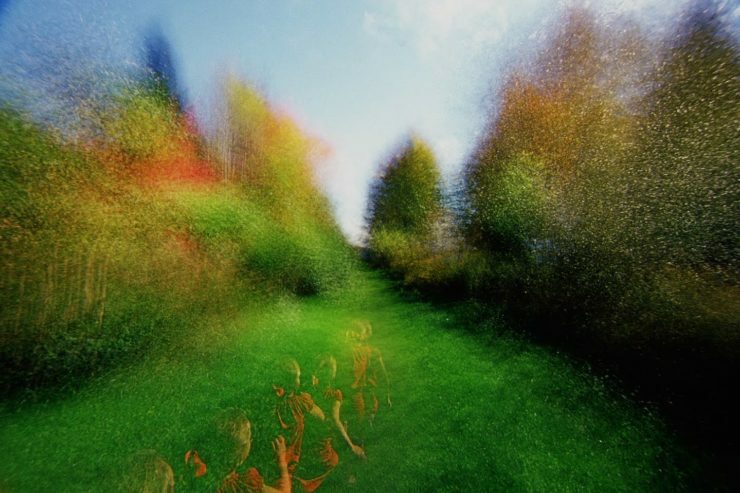 Filmed by repeatedly walking along the same path, exposing each trip over the same roll of film, Larose has transformed his journey from family backyard to Lac Saint-Charles into a radiant depiction of memory—a vision of sparkling impressionistic intensity. A father and his daughter plan a sailing trip; his daughter sails down a creek alone. Brisbane filmmaker Audrey Lam’s latest short is a miracle of contemplative dovetailing editing, as present, narration, conversation and the past become one. A stand of birches. Sunlight brightens and dims, revealing more or less of the woods. A little grass is on the forest floor. Is there a shape in the shadows? Something green is out of focus. The light flashes, and the screen goes dark from time to time. We look up close at the bark of trees. Is the god of the forest to be seen? A fragmented road trip through Britain on the peripheries. Down empty roads, off in the wilderness, a few lone stragglers. My first stop was with Jan Zalasiewisz, a geologist who had been trying to imagine the Earth in one-hundred million years, which seemed like as good a start as any. Lunar observations shot frame-by-frame and long exposures on hand processed 16mm Ektachrome film create a chronicle of the lunar phases. Through their layering, the filmmaker emphasizes that the observer, burdened by memory and changing frames of view, moves along a non-linear time-plane. Free screening at the Karawatha Forest Park Discovery Centre. The discovery centre is easy to get to by public transport. Take the train to Trinder Park Station and walk along Acacia Road or through the forest to the centre. Car access via 149 Acacia Road.